2 Beds 2 / 0 Baths 1,334 Sq. ft. Welcome to Starpoint! A fabulous development which is within walking distance to all amenities; elementary & high schools, groceries, shops, parks, transit and the upcoming clayton rec. Centre. This home features a wide open floor plan through the main with 9' ceilings, gas fireplace, newer wide plank laminate flooring throughout the main and quartz counters & stainless steel appliances in the kitchen. 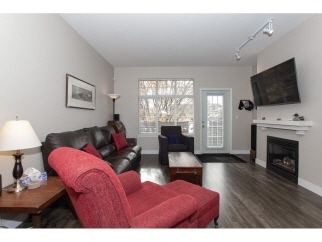 Upstairs has 2 great sized bedrooms including master with private ensuite. In addition to the huge tandem garage with parking for 2 vehicles and storage, the driveway can accommodate a third smaller vehicle and there is street parking right out your front door for guests or larger vehicles.